Brihadeeshwara Temple (Peruvudaiyar Kovil) is a Hindu temple dedicated to Shiva located in Thanjavur in the Indian state of Tamil Nadu. It is also known as Periya Kovil, RajaRajeswara Temple and Rajarajesvaram. It is one of the largest temples in India and is an example of Dravidian architecture during the Chola period. Built by emperor Raja Raja Chola I and completed in 1010 AD, the temple turned 1000 years old in 2010. The temple is part of the UNESCO World Heritage Site known as the "Great Living Chola Temples", with the other two being the Brihadeeswarar Temple, Gangaikonda Cholapuram andAiravatesvara temple. The temple stands amidst fortified walls that were probably added in the 16th century. The vimanam (temple tower) is 216 ft (66 m) high and is the tallest in the world. The Kumbam (the apex or the bulbous structure on the top) of the temple is carved out of a single rock and weighs around 80 tons. 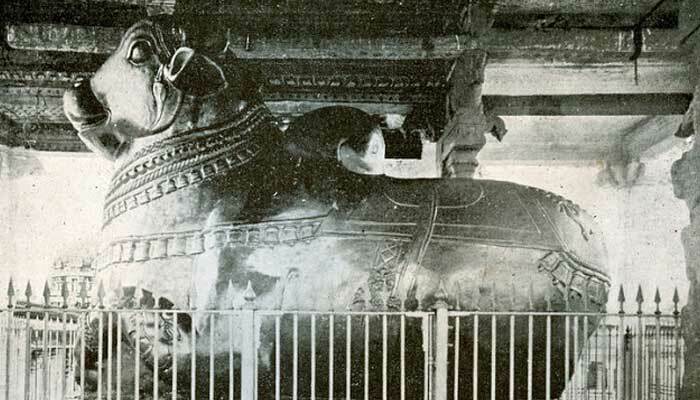 There is a big statue of Nandi (sacred bull), carved out of a single rock measuring about 16 ft (4.9 m) long and 13 ft (4.0 m) high at the entrance. The entire temple structure is made out of granite, the nearest sources of which are about 60 km to the west of temple. The temple is one of the most visited tourist attractions in Tamil Nadu. The much celebrated 'Ponnambalam' (temple with golden roof) at Thillai (Chidambaram) was just a few hours of journey away. Thiruvarur, the most important 'Sapta Vitanka Sthalam’, which had the patronage of the Cholas right from the days of Manuneedhi Cholan and Musukuntha Cholan, was also nearby. So were numerous temples referred to as 'paadal Petra Sthalangals' - temples where the Saivite saints Appar, Sundarar, Sambandhar and Manickavasagar had sung Thevaram hymns (religious hymns praising the deeds of Lord Shiva). Then, what made Rajaraja Cholan build a massive temple in his capital city? 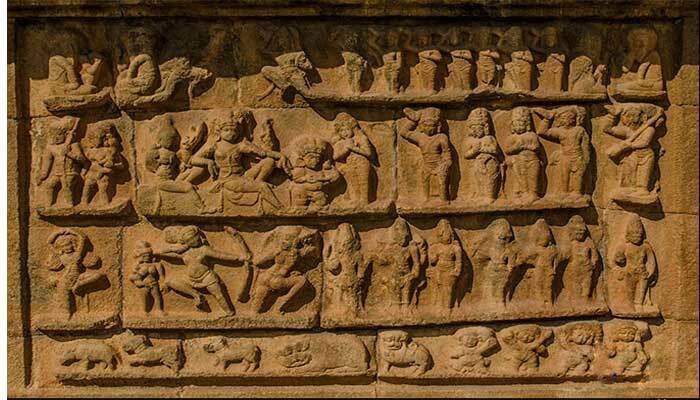 Few centuries back, the Pallavas had given a new dimension to art and architecture. Under their patronage rose the majestic Rathas, Shore Temple and Yali Caves at Mamallapuram. Rajasimha Pallavan built two splendid temples in Kanchipuram 'Paramesvara Vinnagaram' and 'Kailasanathar Kovil'. The latter, dedicated to Lord Siva, held Rajaraja Cholan's attention. He called it 'kachchipettu Periya Thali' (The Big Temple of Kanchipuram). Rajaraja Cholan's dreams and aspirations were always huge. The visionary he was in all matters, there is no wonder that he envisaged a huge temple to celebrate the power of divinity. Many a people, have wondered why he chose to build an imposing monument. Did he want to showcase the power and might of his empire by building something colossal? Did he want to stamp his authority and tell the world, 'Look what I have accomplished?' Did he want to get rid of sins wrought by years of warfare or get a magical cure to a disease of unknown origin, as some people claim? May be the reason was simple. He wanted to show the whole world the towering presence of God that is everlasting against human life that is highly evanescent. Arulmozhivarman, a Tamil emperor who was popular as Rajaraja Chola I laid out foundations of Brihadeeswarar Temple during 1002 CE. It was first among other great building projects by Tamil Chola. A symmetrical and axial geometry rules layout of this temple. Temples from same period and two following centuries are expressions of Tamils Chola power, artistic expertise and wealth. Emergence of these types of features, such as multifaceted columns along with projecting signals of square capitals signifies arrival of Chola style, which was new at that time. It is said that after seeing Pallava Rajasimha Temples in Kanchipuram, Emperor Rajaraja Cholan had the dream of establishing such a huge temple for Lord Shiva. Brihadeeswarar Temple is first among all buildings, which make use of granite fully and it finished within five years from 1004 AD to 1009 AD. 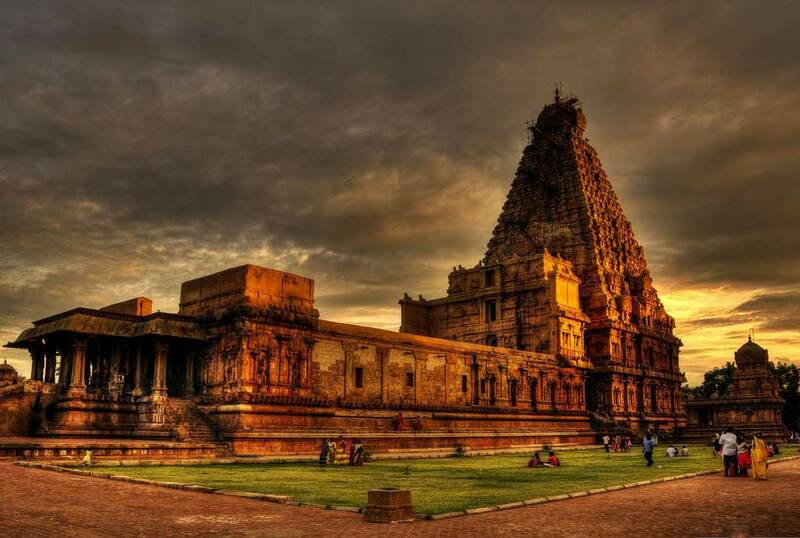 The greatest of Chola emperors Rajaraja-I (985 A.D - 1012 A.D) the son of Sundara Chola (Parantaka-II) and Vanavan mahadevi built this magnificent temple named Brihadisvaram at Thanjavur - the capital of Chola dynasty. From the Epigraphical evidence it is known about Rajaraja-I started building this temple on his 19th year and completed on 275th day of his 25th year. 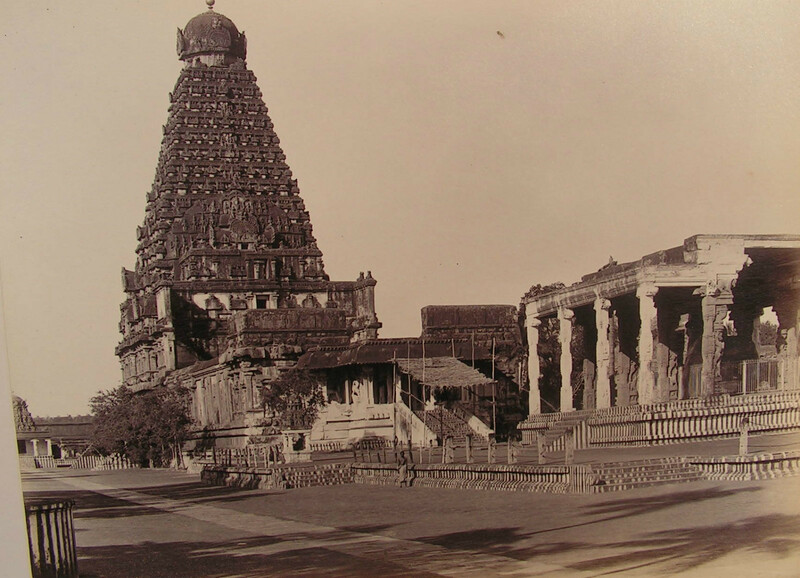 It took just 6 years to complete this work on 1010 A.D.
On the 275th day of his 25th year as king (1010 CE) Raja Raja Chola handed over a gold-plated Kalasam (copper pot or finial) to crown the vimana (dome) as the final consecration of the temple. Brihadeeswarar Temple was the nerve center of the Chola Empire and attracted musicians, scholars, craftsman and merchants. It particularly served as a platform for dancers who excelled in the traditional dance form of Sadir, which is now known as Bharatha Natyam. The Chola reign declined and they were ousted by the Pandyas who were in turn thrown over by the Vijayanagara Empire. In 1535, the Vijayanagara king installed a Nayak king and the clan, called Tanjore Nayaks, reigned till the mid-17th century. In 1674, the Marathas conquered Tanjore. Later, like the rest of the country, Thanjavur too fell into British hands. The inscriptions and frescoes on the walls of Brihadeeswarar Temple record the rise and fall of the city's fortunes. Shiva’s representation is as a gigantic stone lingam. This is covered by a vimanam that extends to 216 feet. It is built with stones that are bonded and notched without any mortar. The topmost stone, an engineering marvel, weighs about eighty tons. Rajaraja-I named this temple as Rajarajesvaram and the deity Shiva in Linga form as Peruvudaiyar, the temple is also known in the deity's name as Peruvudaiyarkovil (in Tamil language). In later period Maratta and Nayaks rulers constructed various shrines and gopurams of the temple. In later period when the Sanskrit language was more popular during the Maratha rule the temple was named in Sanskrit as Brihadisvaram and the deity as Brihadisvara. Now-a-days it is called as Thanjai Periyakovil (Tanjore Big temple). The Brihadisvara Temple was completed in around 1010 in the southeastern part of the new capital Thanjavur constructed in the basin of the Kaveri (Cauvery) River by the king of the Chola Dynasty, Rajaraja I (r. 985-1014). It has also been called Rajarajesvara Temple after the king’s name. It is one of the two greatest temples from the age of the Chola Dynasty together with the Rajendra-Cholisvara Temple built in the next new capital, Gangaikondacholapuram, which was constructed by his successor Rajendra I. Those constructions were prodigious national projects showing the Chola Empire’s hegemony in south India. It is said that the Brihadisvara Temple was erected in only seven years. Its precincts are surrounded with cloisters covering an area of 120m by 240m and are also surrounded outside with heavy brick walls for an area of 350m square including a large tank (reservoir). There is a Nandi Shrine, two continuous extensive Mandapas (worship rooms), an Antarala (antechamber), and a Vimana with a high tower, all in line on the east-west axis. On the same axis stand Gopurams (temple gateways) of the early phase at the eastern center of the cloister and the brick wall. They are the sole entrance spots to the temple precincts. Though they are embellished with sculptures, they look much lower than later Gopurams of huge temples in south India, as the height of the Vimana is great in contrast. The second Gopura on the line of the cloisters is 24m in both width and height, lower than the first Gopura, but its sculptures are larger, with a pair of Dvarapalas (guardian figures) on both sides of the doorway. In the cloisters surrounding the precincts is a line of Lingas (phalluses), symbol of Shiva, and wall paintings from the Nayaka period on the rear walls delight the eye of pilgrims. This Brihadisvara Temple made of granite and brick is the greatest work of the Dravidian (northern) style in its grand scale and high degree of perfection, alongside of the great temple in Gangaikondacholapuram. The development of stone temples in the southern Indian style, having started at the small temples at Mahabalipuram, reached their summit here. 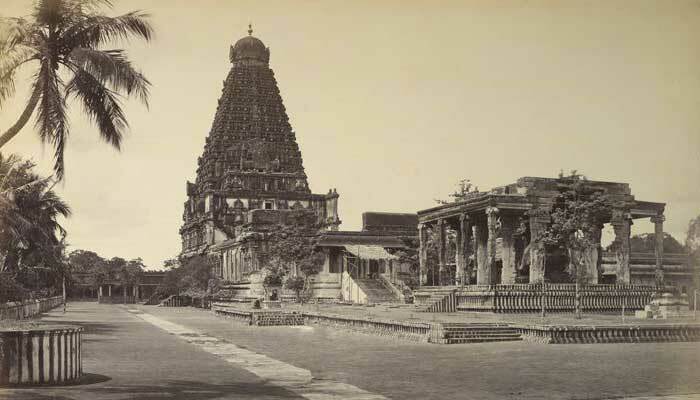 It became the model of the temples to be built in south India and Southeast Asia in the period of the Chola Dynasty. However, after the end of the Chola Dynasty in the 13th century, temple style would change dramatically. Huge Vimanas would not be built anymore, rather temple precincts would be expanded, surrounding the temple in fold upon fold, and constructing only Gopurams in a colossal scale on the four sides. 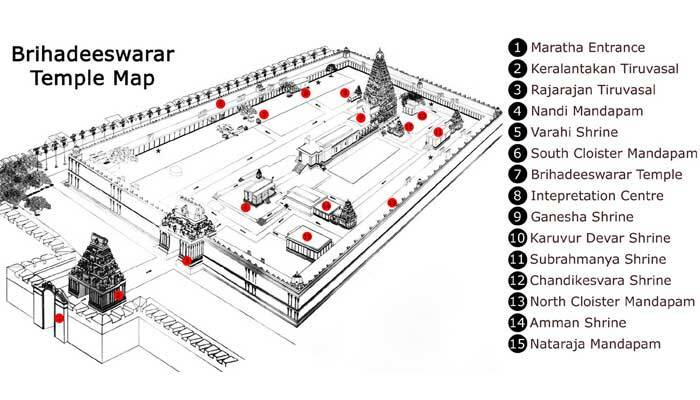 The outer Gopurams would be erected higher, and would eventually attain more than 60m. The relationship of height between the main shrine and its gates would be completely reversed. From this point too, the Brihadisvara Temple in Thanjavur is the best representative of orthodox south Indian temple architecture.